As the U.S. unemployment rate edges lower, more Americans are getting back to work and it’s taking them longer to get to work. Since 2009, commute times nationwide have been on the rise. Some of this increase is due to more people commuting, but also some may be due to a shift in where people live. Between 2006 and 2014 the percentage of Americans renting has jumped 5 percentage points to 43.3% from 38.5% as a result of switching from homeownership to renting. As such, we wanted to explore whether the big shift towards renting over the past 10 years has led to shifts in commuting. We found renters are far more likely to live closer to work, take public transportation and have shorter commute times than their home-owning counterparts. In fact, renters have shorter commutes in 43 of 50 major metros, spending an average of one-and-a-half minutes less a day commuting than homeowners in those cities. 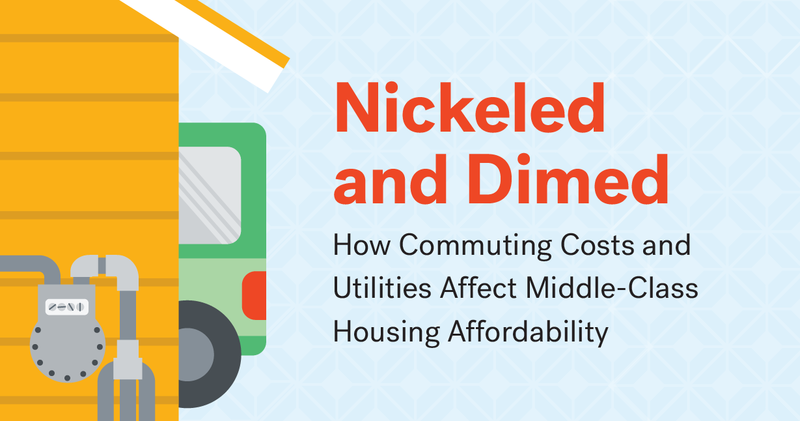 While this may seem small, it adds up to more than a full 8-hour workday, 8.7 hours, that the average renter saves in annual time commuting compared to an average homeowner. Commute times in the 50 biggest U.S. metro areas have risen steadily, jumping to an average of 27.2 minutes in 2014 from 26.4 minutes in 2009. Americans ranked short commute times to work or proximity to public transportation second only to crime rate when it came to determining where to rent or buy a home. Even so, only 15.9% of Americans said short commutes or proximity to public transportation were among their top criteria in picking where to live. Working millennials who are renters valued short commute times or proximity to public transportation more so than low crime rates. Riverside-San Bernardino, Calif., Houston and Long Island, N.Y.; ranked as having the shortest commutes for renters compared to homeowners. 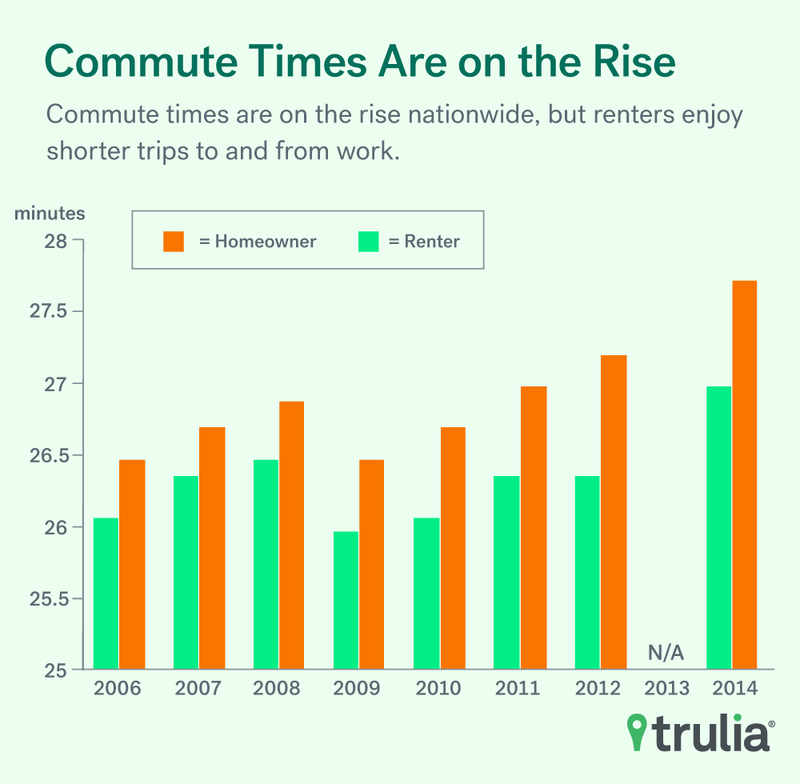 Renters had longer commutes than homeowners in San Francisco, Detroit and Cleveland. 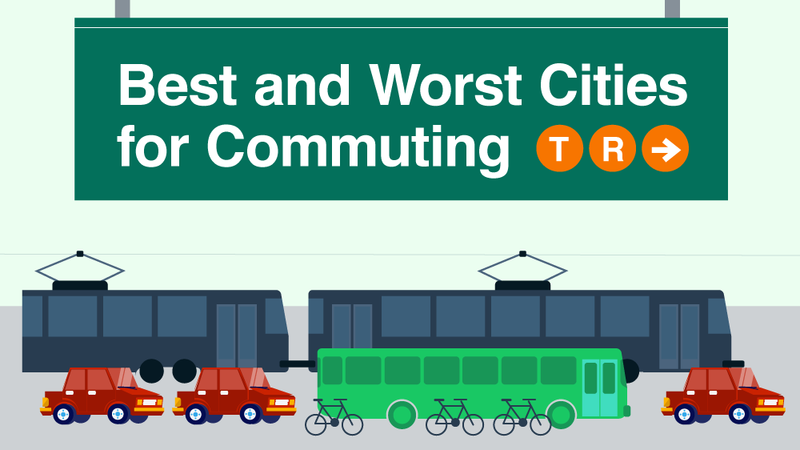 Who’s Winning The Commute-Time Race? In 43 of the 50 major metros studied, renters had shorter commute times than homeowners, though commute times for both groups have been rising annually since 2009. What happened? The 2008 financial crisis caused a sharp spike in unemployment, which explains the sudden dip in commute times from 2008 to 2009. Note: 2013 was excluded due to lack of U.S. Census American Community Survey data. Data from the top 50 metro areas were used to conduct this analysis. 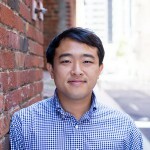 How Important is Living Close to Work? With commute times getting longer each year, it’s no surprise that most people would like to live closer to work. 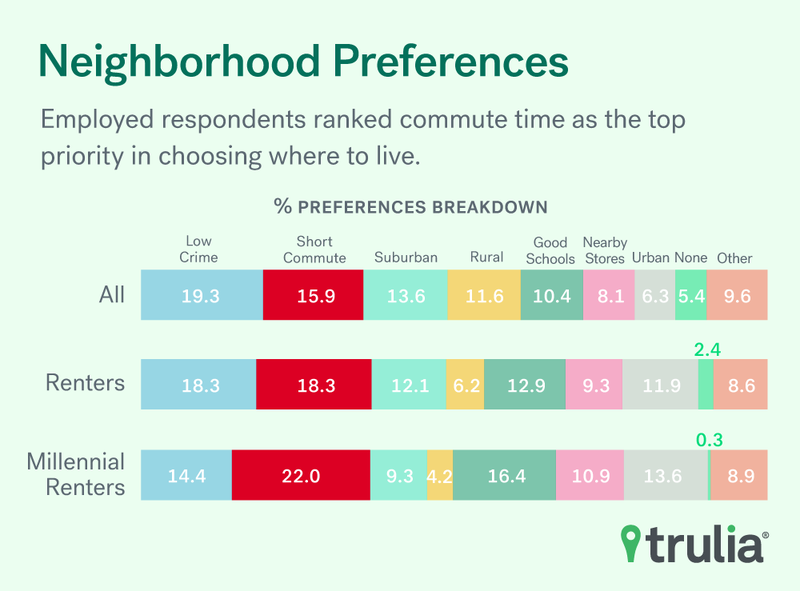 When asked about their neighborhood preferences, 15.9% of working Americans picked either a “short commute to work” or “nearby public transportation” as the most important quality for their next neighborhood they would call home. Bigger metro areas tend to have longer commute times for both renters and homeowners. For example, New York metro is by far the worst for both renters and owners, with an average one-way commute time of 34.8 minutes for both renters and owners. 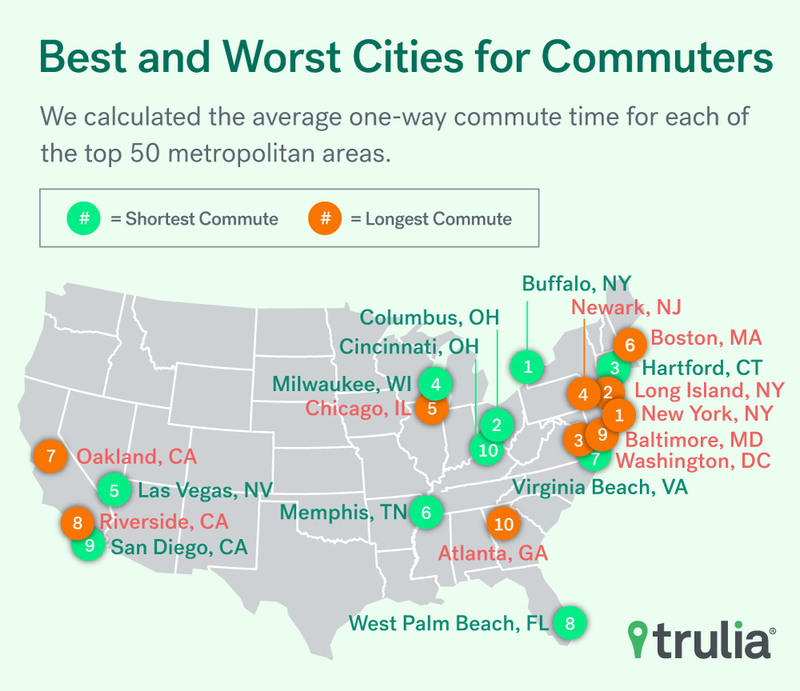 Meanwhile, smaller metros such as Buffalo; Columbus, Ohio, and Memphis, Tenn., had the shortest commute times, as these metros have less population density and road congestion. For a sortable table of metros with commute times click here. In 43 out of the 50 major metros studied, renters are beating homeowners in commute time by about one and half minutes. The metro areas where renters spend a shorter amount of time on the road versus homeowners were Riverside-San Bernardino, Calif., Houston; Long Island, N.Y., Austin, Texas, Newark, N.J, Cambridge, Mass., Washington, D.C.; Dallas, Columbus, Ohio, and Memphis, Tenn. But in some metro areas, such as New York, Orlando, Fla., and Detroit, renters do not have much of an advantage or even have a disadvantage. Renters and homeowners, on average, tend to be different demographically. Homeowners are more likely to be older, have children, and live in larger homes. 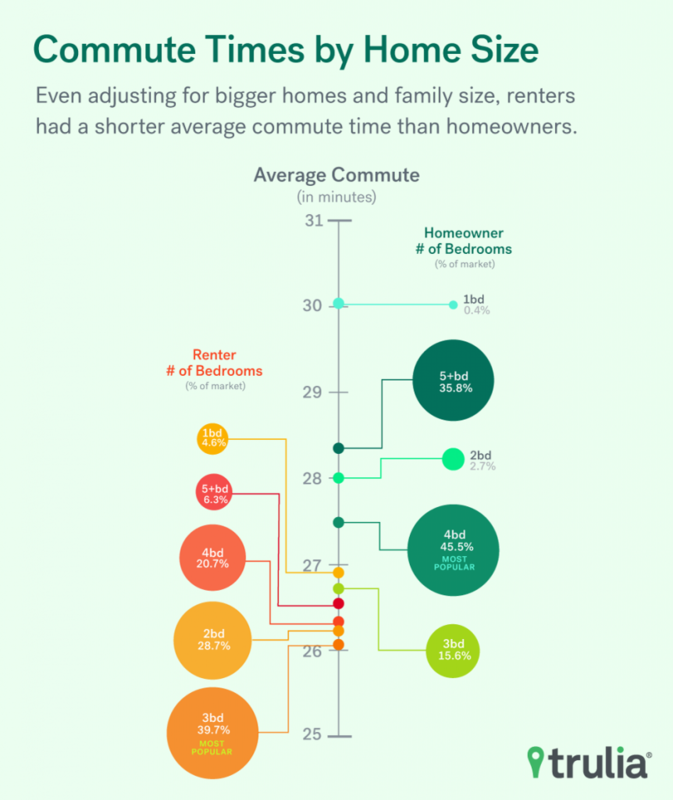 So to do an apples-to-apples comparison of commute times between renters and homeowners, we controlled for the home size and family sizes to see if there really was a difference after taking these factors into account. First, we controlled for the number of bedrooms in the household, and found that even then, renters had a shorter average commute time than homeowners did in 2014, as shown below. Even when considering the size of households, renters still beat homeowners. The results when controlling for the number of children in a household is surprising. If you had three kids or more, conventional logic suggests that you’d want to live in the suburbs (which tends to have longer commute times than city centers) where there are typically better schools, less pollution and crime, and bigger homes – regardless if you were renting or buying. The results seem to indicate otherwise. These large-household-renters may put a very high value on having a short commute, because after all, time spent in the car is time spent away from their family. For a sortable table of commutes based on household and house size, click here. Survey data was filtered so that only those with full- or part-time jobs were included. In addition, data on millennials included only those who are current renters as of the survey date or those who responded as willing to move into a rental home within the next 12 months as of the survey date. Survey data came with weights for each observation so as to enable us to accurately represent characteristics of the U.S. population. For the rest of the analysis, 2014 American Community Survey (ACS) data was used. Observations that were heads-of-households, 18 or older, and also employed were used to compute statistics. Certain metro areas with sample size issues were excluded. These metro areas were as follows: Philadelphia, Montgomery County, Pa., Camden, N.J., Kansas City, Mo., Louisville, Ky., Nashville, Tenn., New Orleans and Oklahoma City. 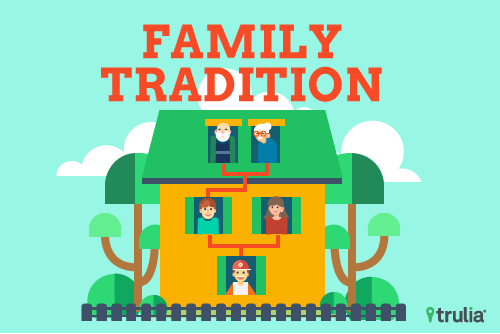 Homeownership is strongly influenced by family. Children of parents who owned a home are nearly three-times as likely to own when they’re adults. This predictor suggests young millennials may have the fewest percentage of homeowners in the last 50 years. New homes dominate the market across the Sunbelt and typically cost more – and have more space -- than older homes. But in most markets, you can also find older homes with historical features and distinct architectural styles. 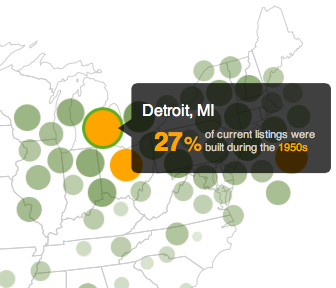 In a few metros, like Charleston, SC, and Washington D.C., the oldest homes cost the most. 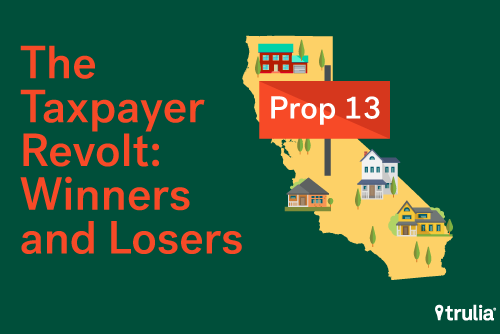 California homeowners saved more than $12.5 billion in property taxes last year because of Proposition 13, with long-time residents in more affluent cities receiving the biggest breaks. Middle-class homebuyers in California are the most squeezed when it comes to finding a home within their budget, while those in Ohio have plenty of options.